On Saturday 27th October, Lydia and I were invited to a DesignaFriend VIP style press event in London. I told her about this a few weeks prior and she had been talking about it non-stop ever since; she was especially excited for one-on-one time with mummy. As we approached the event venue, which is called The Icetank in Covent garden, we could see the DesignaFriend banner and a red carpet welcoming us as VIP’s. As we got closer, we could see inside and her little face had the biggest smile. Inside we were greeted by the lovely Rachel, who looks after DesignaFriend’s PR, and she gave Lydia her name sticker, directed us downstairs to hang up our coats and to have lots and lots of fun. All the dolls were set out for the children so they could see the variety of dolls they can collect, aswell as seeing all the fashionable stylish outfits they can wear. We made our way down the swirly stairs and as we got to the bottom, Lydia’s little jaw dropped. Everything Lydia loved was down there; pink, arts and crafts, and a little hair and nails salon. All the stations were named after the dolls. 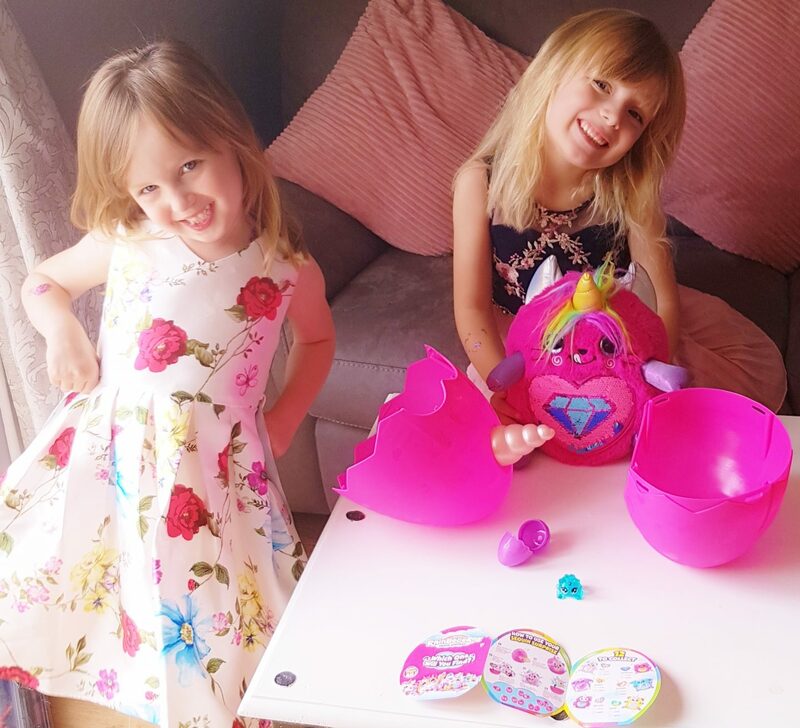 Milly’s styling salon, which had a charm jewellery making table that consisted of sets from Interplay’s craft box charm jewellery ranges – mermaid, fairies and unicorns, three of Lydias favourite things. Lydia also had her nails painted in Milly’s styling station. She chose a lovely turquoise colour using Fablabs style lab to match the colour in her hair. I personally love these nail varnishes as they painted on so nice, they didnt need two coats and dried fast too. Another great thing about these is that they just peel off when you want to either choose another colour or to take it off for school. There was a little hair salon where she could have her hair styled and have colours added using Fablabs style lab hair chalk. Lydia chose the same colour as her nails, which surprised me as I thought she would go for pink, but I think she just wanted to be different. The hair chalks are great too and easy to use. The colour was vibrant and washed out easily that night. It was lovely watching her have her hair styled. She looked so adorable just sat there smiling in the Hollywood styled mirror like a little celeb. Ella’s fashion school where the children got to design their very own outfit using materials and bows used on the actual dolls. 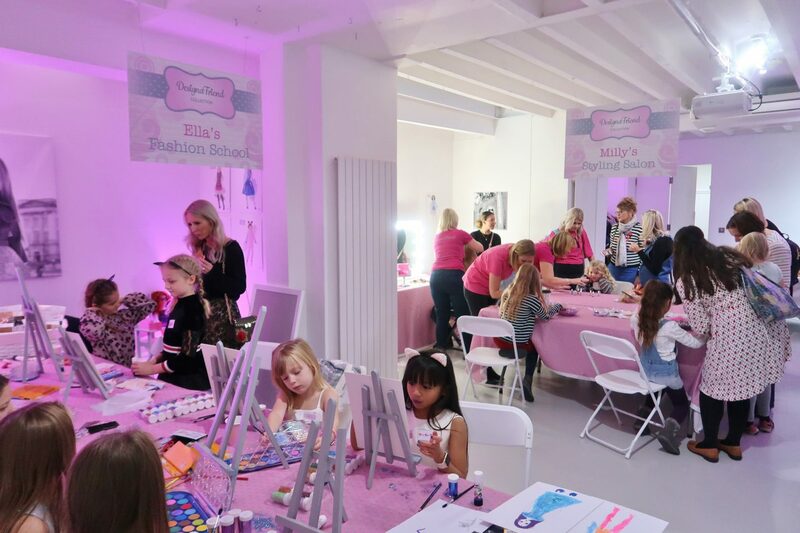 They had everything set out from the fabric, bows, a huge variety of different shades of glitter, paint sticks by Little Brian – which are brilliant as they do not make a mess and dry instantly – glue sticks, scissors and everything a little fashion designer would need for her board. After having a really fun time downstairs we decided to go upstairs and explore. The first thing Lydia spotted was the pink lemonade and all of the delicious tasty treats. There was DesignaFriend cookies, dainty cupcakes and biscuits decorated with edible flowers. They certainly know how to make little people feel very special and important. She was in her element and so was I.
Bella’s glamping tent was a huge tent styled to match the DesignaFriend glamping tent, which was also set out in the middle for the kids to play with. There were other furniture sets, set up from their range like the dolls house. Lydia loved the dolls house. Last but not least was Arianna’s photo studio where the girls could dress up and twin with their dolls for a special photoshoot. Lydia chose a pug onesie for her and her doll Ella and off she went to get changed ready to be papped. Here is one of the photo’s we got to keep. 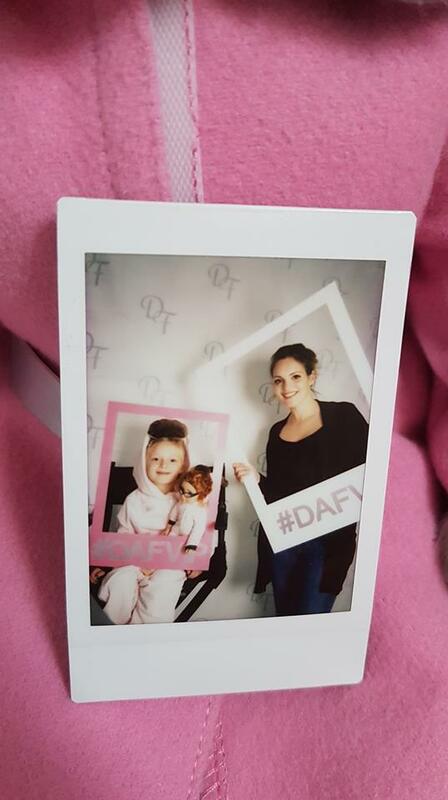 -DesignaFriend Doll, she was thrilled to receive Ella. 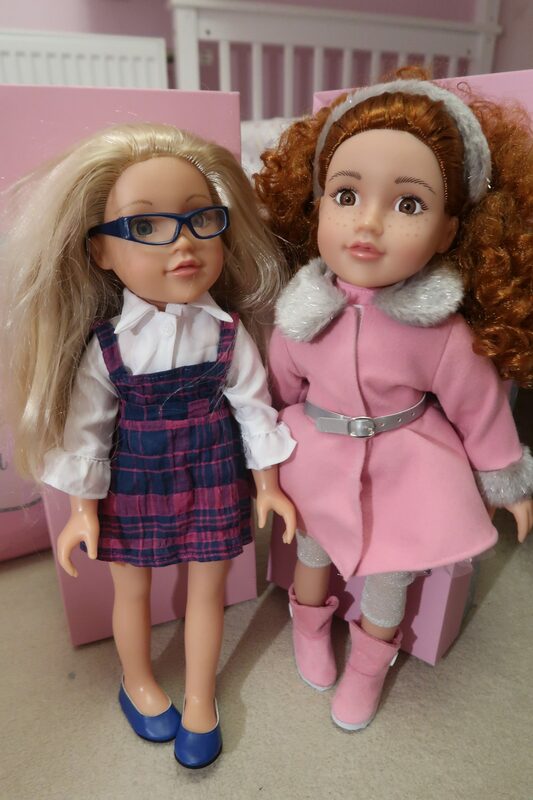 -DesignaFriend Outfit, Lydia received a winter wonderland outfit in Pink that included glittery leggings, a pink top, sparkly skirt ,pink boots, a beautiful winter coat and a fluffy headband to complete the look. -Little Brian Day glow paint sticks. The morning had gone so fast as we was having so much fun, but all good things must come to an end so off we went back downstairs to get our coats on and say our thank yous and goodbyes. To WirePR and DesignaFriend, thank you so much for inviting us both. You really made my beautiful girl feel extremely special and we thoroughly enjoyed our day. It couldn’t of gone any better and all of the staff were so friendly and approachable with big smiles on their faces. Lola (left) Lydia received for her birthday and Ella (right) received from the DesignaFriend event. 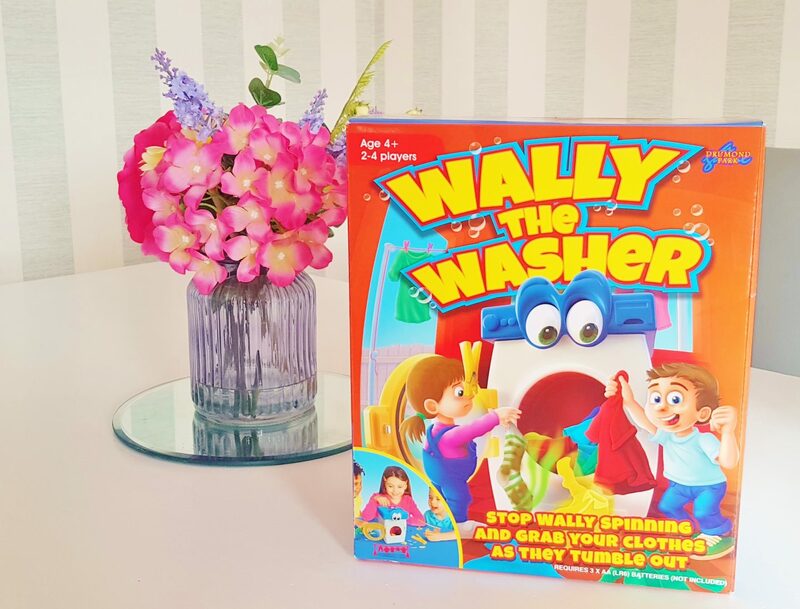 Wally The Washer table top game review and GIVEAWAY!!!!! Put all the clothes into Wally and watch him spin! 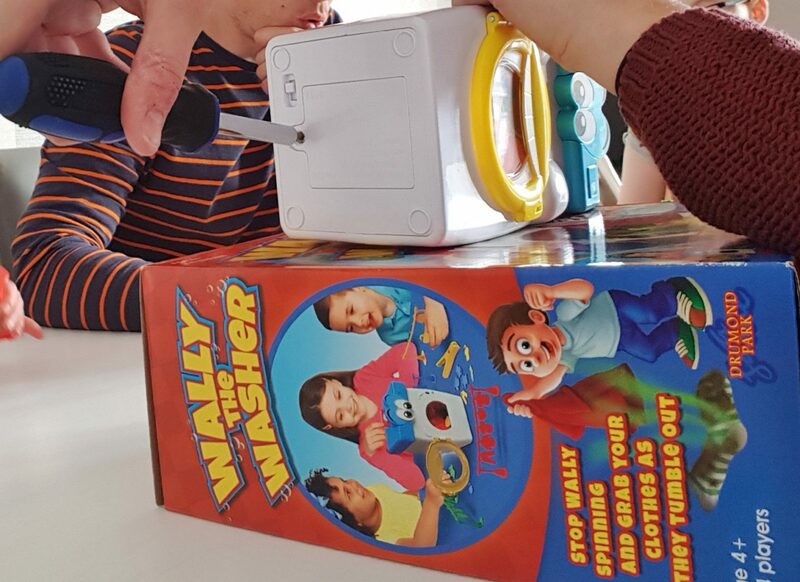 Young children just love watching the clothes spinning round in their washing machine at home – and now they can have their own toy version, meet Wally the Washer. You will need 3 AAA batteries for this game as they are not included. 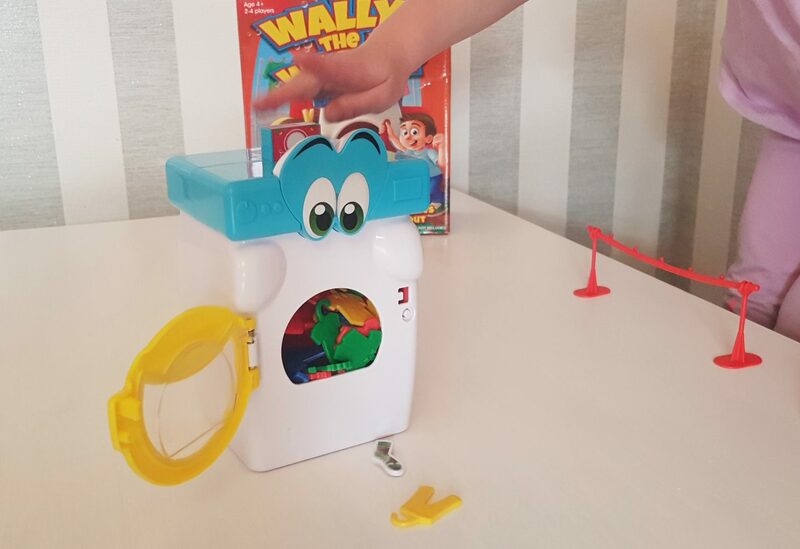 It is a very easy game to set up and a really easy game to play. Once set up, each player picks which colour washing line they want to be and then the youngest goes first. 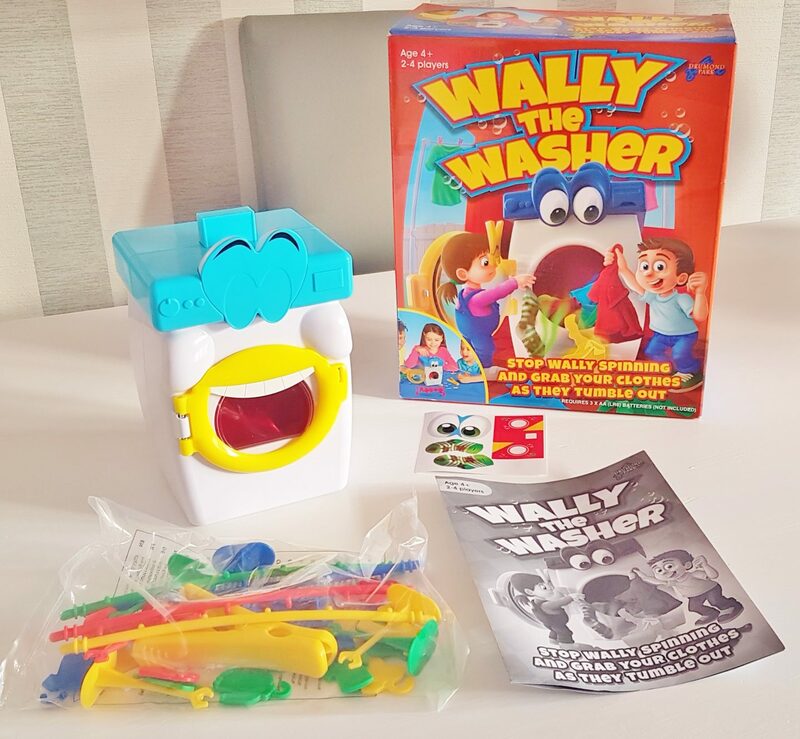 When it is your turn, press the washing powder button down and Wally will stop spinning and spit out a random mixture of washing. Each player then has to take their colour washing and hang it on their washing lines. 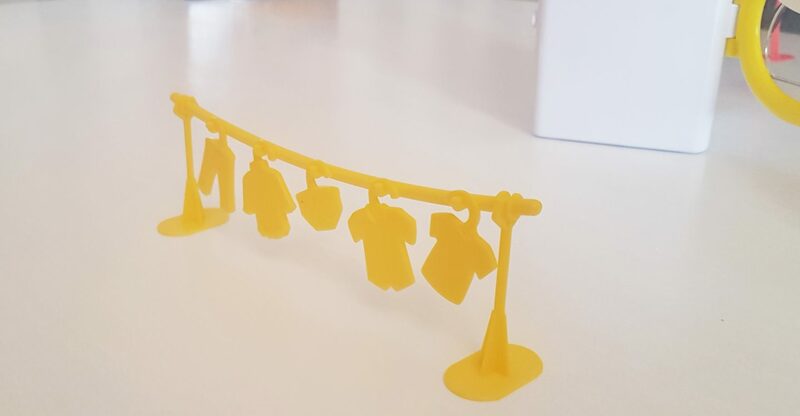 There is one smelly sock inside the washing machine and If that comes out with the washing on your turn then you have to wear the peg on your nose until the next person gets the smelly sock on there go. The game is finished when the player who has retrieved all their matching washing first wins. We keep on playing for a 2nd, 3rd and last place so that the game isn’t over quickly. 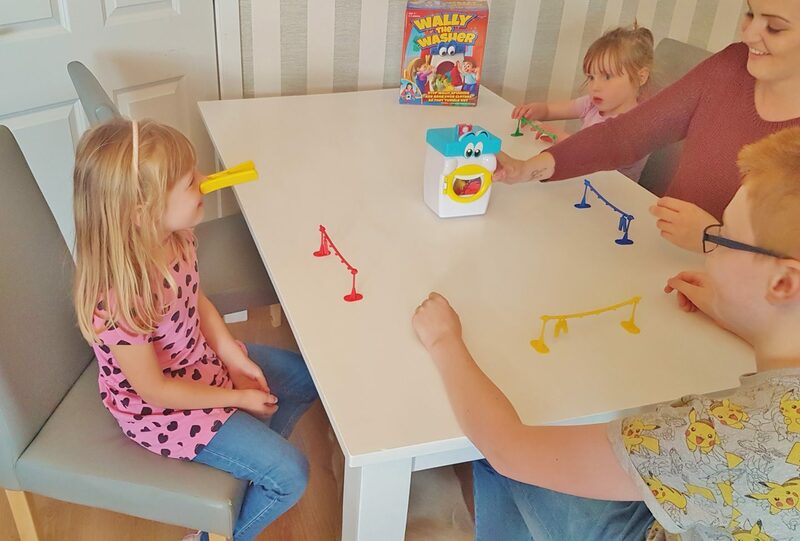 It is not a fast-paced game, so reduces arguments between the kids in regards to the quickest person grabbing their washing first as everyone has their own colour to collect. 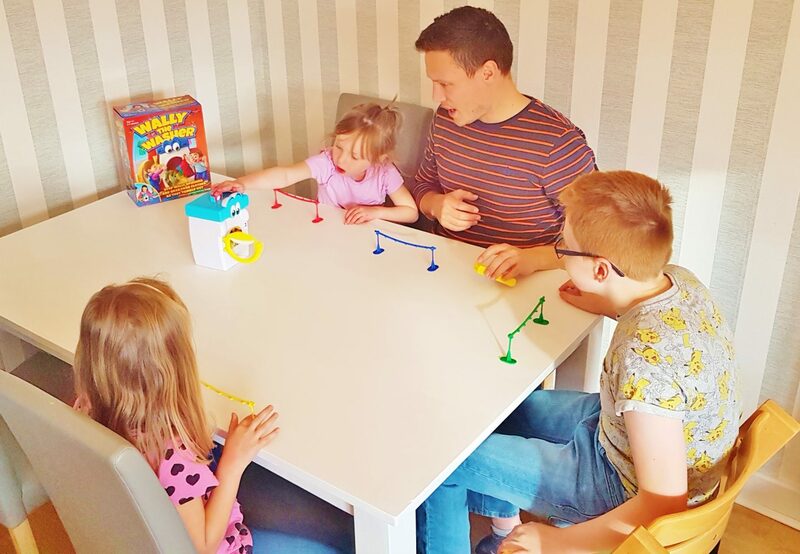 The game doesn’t take long to finish so you don’t mind playing over and over again and the kids thoroughly enjoyed playing, especially Emily. 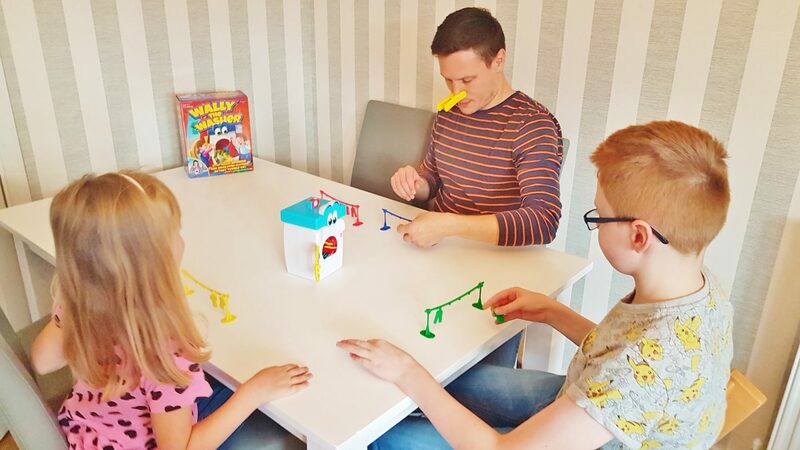 This game would make a wonderful birthday/Christmas gift for a young child, it also teaches young children to learn simple colours and basic counting whilst also playing with Wally as a toy and in my opinion worth the £24.99. To win your very own, you can enter below. All the way from Rainboville the Rainbocorns have arrived and with 12 to collect we, we couldnt wait to get started. Your cute little plush is covered in a bright plastic egg shell with a unicorn horn on the front. Lydia was so excited to crack this egg open and see what was inside. On the front of the Egg there is a heart shaped reversible sequin patch which is covered by clear packaging tape to stop you trying to get a sneaky peak of the suprise under the sequins before you have unwrapped it. The egg is also covered in question marks and love hearts to make the reveal even more intriguing. 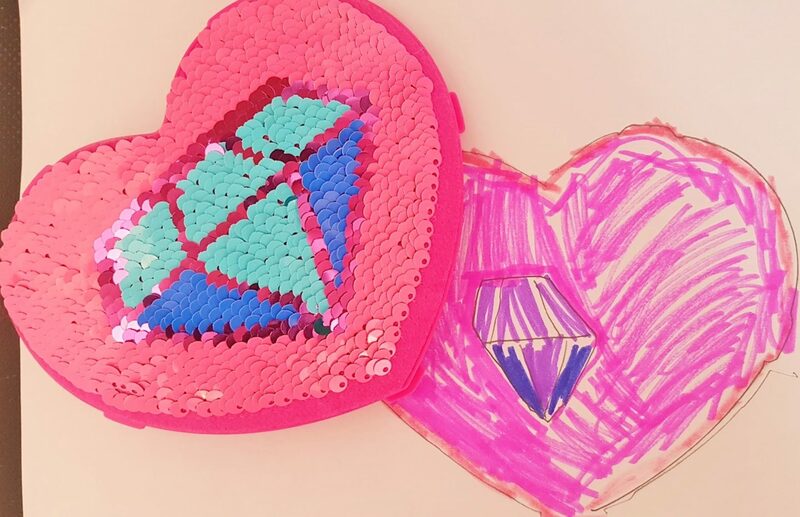 Once Lydia had removed the packaging around the egg she brushed her little hand over the heart to reveal a DIAMOND, and I kid you not this girl squealed when she saw what was inside. 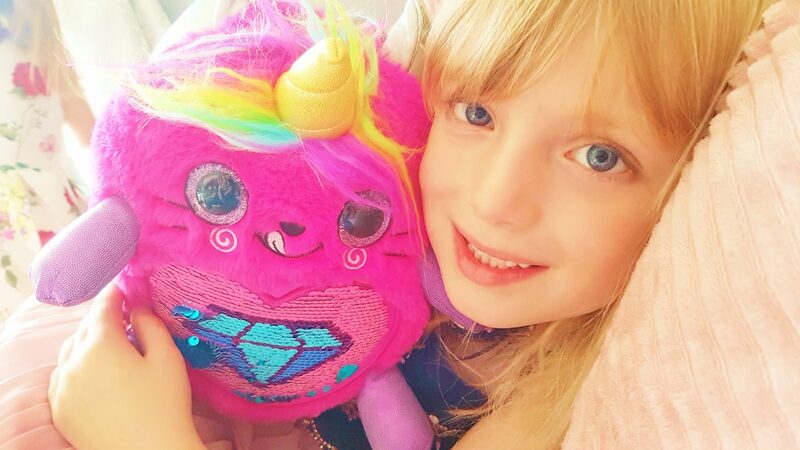 A big bright pink with glittery eyes, rainbow hair, unicorn horn and wings plush toy. Also inside the bottom piece of the shell there is another little suprise hidden which she was very keen to investigate, she removed the top part of the little egg inside to reveal her very own Boo-Boocorn and it was a Kittycorn. There are 22 different Boo-Boocorns to collect with 3 in each category. Hamstercorns, puppycorns,, bunnycorns, kittycorns, monkycorns and Unicorns. But can you find the RARE Boo-Boocorn TWINS? these also come in the same 6 categories with 12 pairs to collect. Inside the egg you will also receive the famous collection guide with all of the Rainbocorns and Boo-Boocorns to collect. 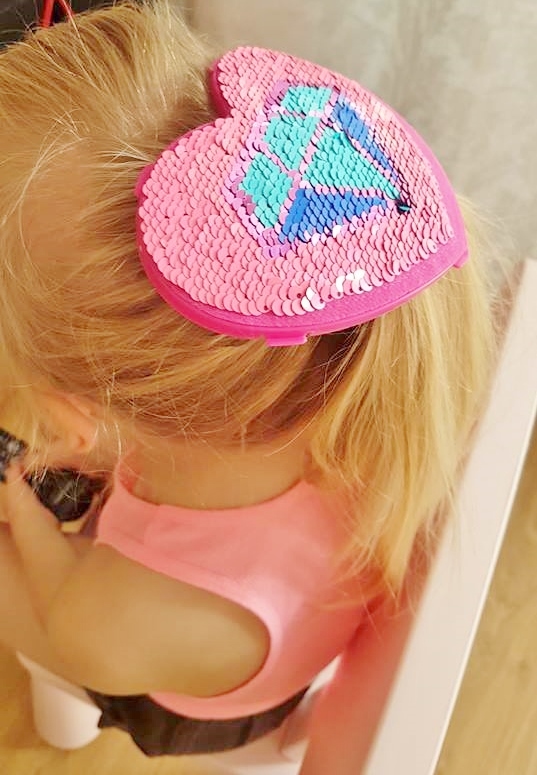 Once you have unleashed your suprise’s you can pop the sequin love heart out of the shell and simply clip it on to your Rainbocorns heart which is now complete and ready to be cuddled and played with, you can also use the sequin heart clip in your hair. The egg shell case makes a very cute storage option for your child’s bedroom too. 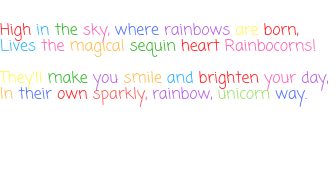 Rainbocorns have their own webisodes which you and your children can enjoy watching together. Lydia and Emily especially love this one. Their favourite part is when GiGi throws a pretend ball to Scruff so he would go and let her sleep as they do this to Rosie our dog and then laugh when she chases thin air. How much Is a Rainbocorn sequin suprise? Rainbocorns are priced at £24.99 and are available from Argos, Smyths, The Entertainer, Asda and B&M. Monkeycorns are sold exclusively in Argos. 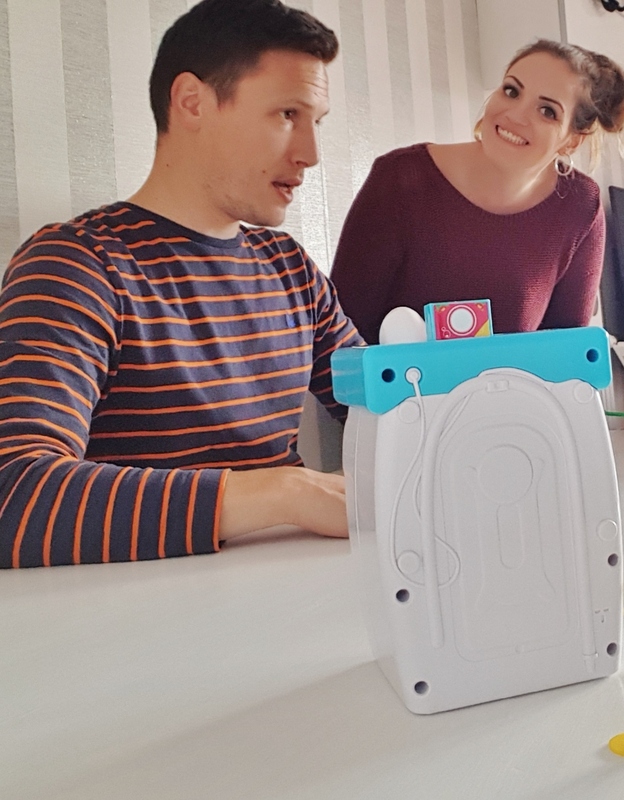 They do not need batteries and do not make any noise, so your child’s imagination can run wild with creativity during play time and also have a new bedtime buddy to cuddle up too at night. Lydia also wanted to draw her own picture here for you all to see, what do you think? At the back of our house we have a meadow which means we get ALOT of spiders, this does not mean we are used to them its quite the opposite. 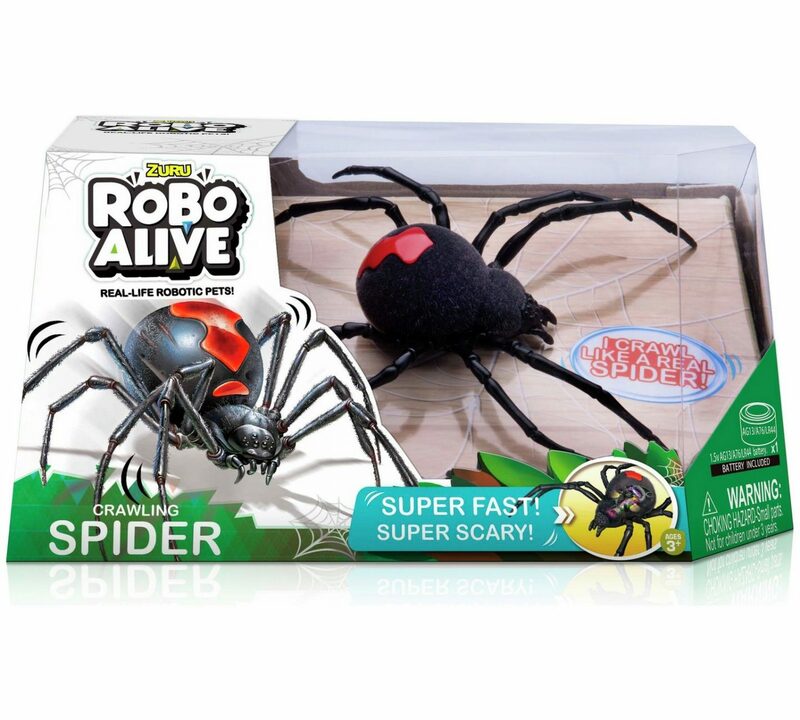 All of us including David do not like them but I just had to review one of these because they looked so cool and I just knew my children despite not liking spiders would love this and I was right. 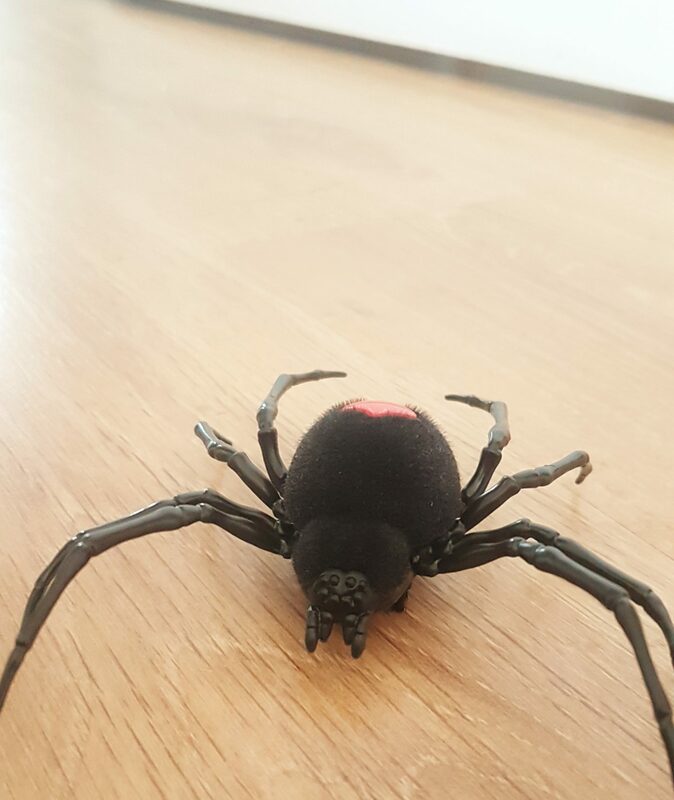 The spider is a decent size with a red marking on its back, similar to the red back spider and has a furry life-like body. If I was to place it on the palm of my hand it would take up most of it. Turning it on its back the spider has two lines of brittle brushes which helps it glide along hard flooring quickly like a real spider would. The spider will not work on carpet. When placed on the floor it moves fast and the legs guide around any obstacles that get in the way so you dont have to keep moving it when it gets stuck. 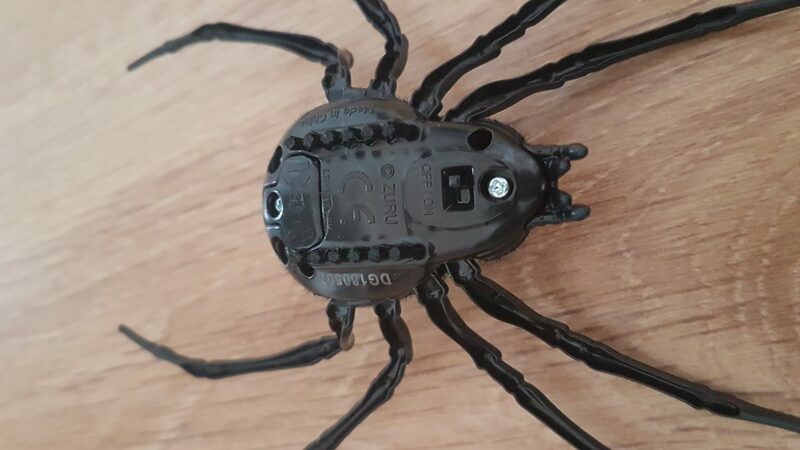 I can see us having a lot of fun with this little arachnid. 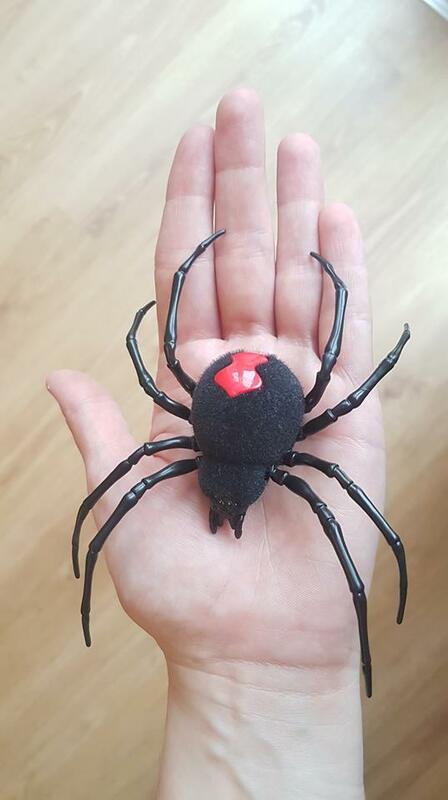 Emily has even given it a name ‘Shirley’ haha Shirley the Spider and she carries it around with her everywhere, she even wanted to take it to school and scare her friends. Shirley sleeps next to her at bedtime which by the way would be so hilarious if she had woke up and forgot she had put it there, mean mummy. This hair little critter would make an excellent gift or stocking filler for both girls and boy and even adults, I know a few adults who would be over the moon with one of these. We all hear that dreaded statement most days, I know mine say it and it is usually because they want to go on some kind of technology. I used to either switch the tv on or give the kids their tablets when they said they were bored. It was an easy way to keep them quiet and occupied whilst I got on with what was needed to be done. Otherwise they spend all morning whinging and whining and when you have three of them it can get frustrating. 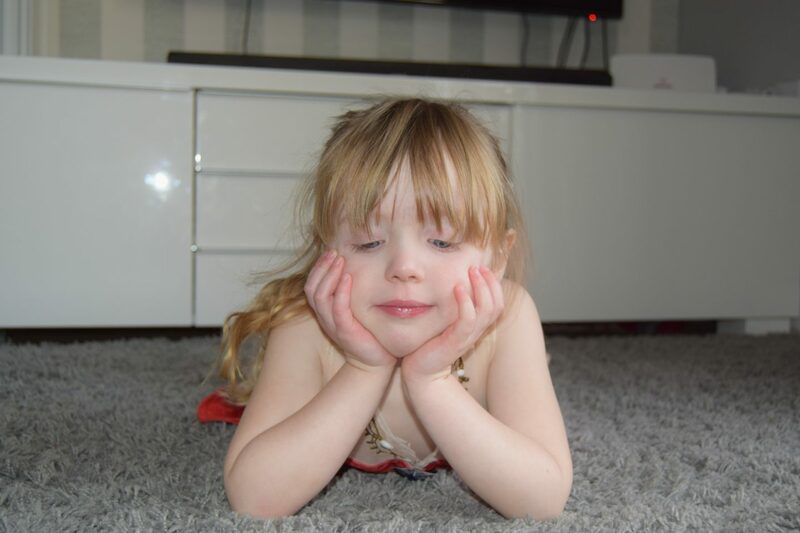 When asking them to come off their devices or switching the tele off, their behaviour would completely change and they would act like completely different kids because they got so angry. So enough was enough and a few years ago I decided to put all tablets in the cupboard with flat batteries. Thankfully the 3 kids are also very creative, artistic and imaginative and they love drawing. So the majority of the time they are happy to sit and be creative with their arts and craft supplies. As part of BIC® KIDS Young Artist Award, Bic conducted a survey which showed that only 31% parents admitted to giving their child a digital device to keep them occupied. Their research has also shown that children spend 3 hours a day away from their screens. When it comes to the most popular ways of banishing the boredom, parents and children clearly have a difference of opinion. While the go-to forms of entertainment for children include watching TV (68%), playing with a tablet/iPad (61%) and watching YouTube (60%), parents tend to favour more traditional pastimes.